Mary Kay will donate $1.00 from the sale of each Beauty That Counts Mary Kay NouriShine Plus Limited Edition Lip Gloss to the Mary Kay Foundation in an effort to end domestic violence, through December 15, 2012. The Mary Kay Foundation has donated millions of dollars from the worldwide sales of Beauty That Counts to causes that change the lives of women and children everywhere who are affected by domestic violence. There are two shades available in this Limited Edition offering, and they retail for $14.00 each for a 0.15 fl. oz. tube. 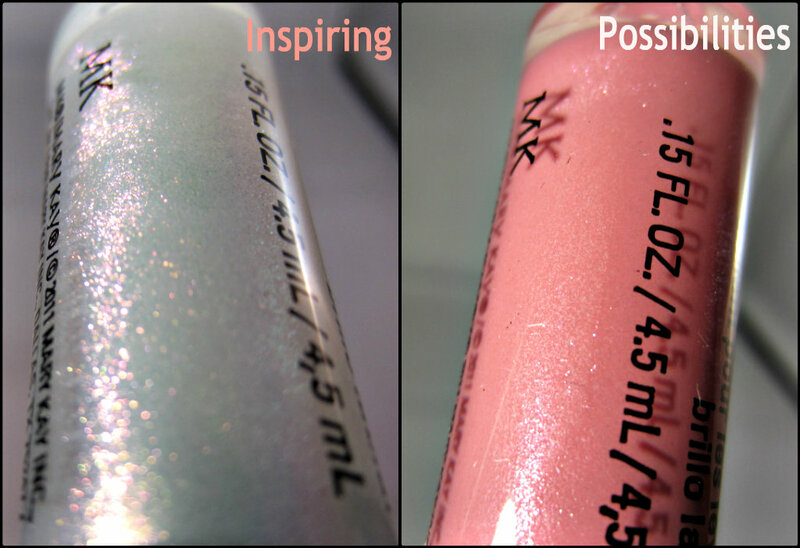 Inspiring is a milky white pearlescent shimmer that can be used alone or over another gloss shade, and Possibilities is a soft pink color. 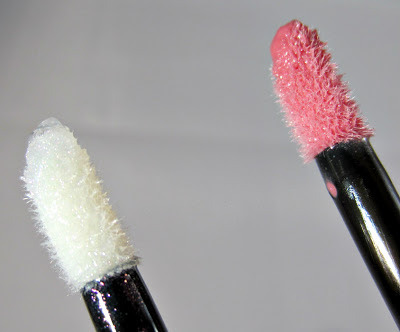 These glosses provide a high-shine finish and contain moisturizing, smoothing and soothing benefits. The gloss cap and carton are graphically appealing with special "thank you" messages in five different languages. The applicators are an angled plush doe-foot style. 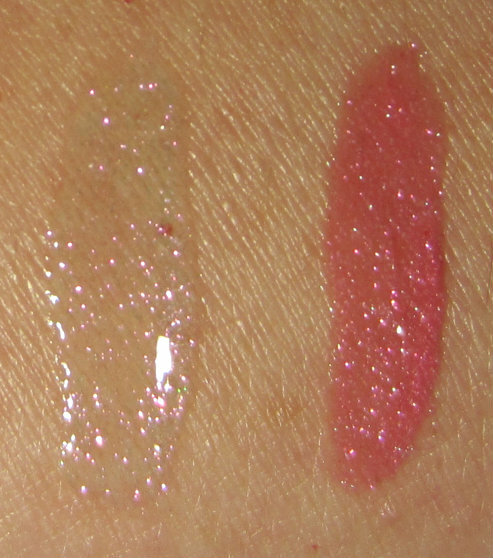 Both of the gloss shades have some shimmer, but I don't notice it "on the lips" with the pink shade Possibilities as much as I do with Inspiring. It's a pretty shimmer in Inspiring though, without being too glittery. I would decribe it more as subtle iridescent light-reflecting micro particles. The swatches show you a better representation of the actual shades. I enjoy wearing the pink Possibilities as my base color, and then dabbing a bit of Inspiring at the center of my lips to give an illusion of fuller lips. Possibilities is a pretty antique rose shade--sort of a "my lips but better" shade for me, and Inspiring can be worn alone to give lips a nice shine and a hint of sparkle, or it can be added to another shade for subtle highlight and dimension. The formula on the NouriShine glosses is a nice mixture of being just sticky enough without a thick or annoying feeling. They're not as thick as say MAC Lip Glass, and they glide on very nicely and are comfortable to wear. They feel smooth and moisturizing, and seem to leave my lips feeling soft and hydrated long after the color has worn off. They will need to be reapplied periodically throughout the day to maintain color, and I would categorize their wear time as just above average. You can purchase these products at Mary Kay's web site here, and the site will help you locate an independent representative to purchase them from. *All limited-edition products are available while supplies last. Products featured were furnished for review.